When I was a lad of 21, I was paid ten quid to play saxophone on a three-hour session in a makeshift studio in London. 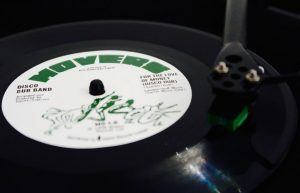 It was a funky disco version of For the Love of Money, without vocals and it did quite well, reaching Number 2 in the Northern Soul Charts in England. We musicians were all strangers but the bloke who put it all together, Davit t Sigerson, gave us the name of The Disco Dub Band. Imagine my surprise, 41 years later, to find that it has been reissued (by @therealmrbongo). You can listen to it here. I think everyone shares your surprise, James.